Celebrate Odd Fellows History by Making History! It's a Trifecta Anniversary Extravaganza! Celebrate the 200 year anniversary of the Independent Order of Odd Fellows, by boarding a luxury coach for a magical history tour of the glory days of Odd Fellowship in Portland. Learn about the pivotal role that Odd Fellows played in the development of Portland, as we visit pubs that used to to be Odd Fellows Lodges. Tour is 2 pm to 7 pm finishing at Peninsula Lodge with a trivia contest and Gourmet Odd Fellows Birthday Cake. No charge if you have already taken the degree. Celebrate the 125 year anniversary of the Muscovites by stepping back in time and taking this historic fun degree! Although the Muscovites are an Odd Fellows tradition, membership is open to all men and women who belongs to any fraternal order or service organization. This year's degree will make history as all participating will be able to sign the warrant to grant a Muscovite charter to the Philippines! Degree starts promptly at 2 pm Pacific Kremlin Time! Attend the grandest, most elaborate, most entertaining charity event in all the seven kingdoms! Singers, dancers, and master brewers all compete to earn your tips. The contestant in each category that raises the most money for charity wins a plaque declaring them to be Best in the Universe, as judged by you, the Odd Balls! Admission includes two full hours of entertainment and an all you can eat feast fit for a Czar! Gourmet Muscovite Birthday Cake included. Sunday, April 28, Museum Grand Opening. $0, Free, Nada! Celebrate the 125 year anniversary of Peninsula Odd Fellows Lodge #128 by attending the grand opening of our Museum of Odd History. 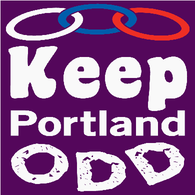 See for yourself, how IOOF and GUOOF Odd Fellows helped shape the City of Portland. Enter to win great prizes, get your mug in the commemorative Grand Opening Photo, and of course . . . eat Gourmet Peninsula Odd Fellows Birthday Cake!